When remodeling your kitchen, it’s important to take into consideration the fact that while you’re remodeling for yourself now, sooner or later a potential buyer is going to be looking at your kitchen. Including design features that have a lasting value is a great way to increase the value of your kitchen to a future buyer, and ensure that your kitchen doesn’t go out of style. From color scheme to design to appliances, learn about some of the kitchen trends that are here to stay in this week’s blog. A transitional design is ideal because it meets somewhere in the middle of contemporary, which can feel too boring, to traditional, which has a more homey feel but can also appear too kitschy. Merging the best aspects of both in a transitional kitchen design allows you to get the best of both worlds and increase your kitchen’s appeal. With Baby Boomers hitting retirement age, accessibility is more in demand than ever before, and it’s not likely to go away any time soon. Even for a younger population without extra accessibility needs, an accessible kitchen with plenty of space just feels good and makes design sense. Energy efficient appliances have really taken off in recent years. 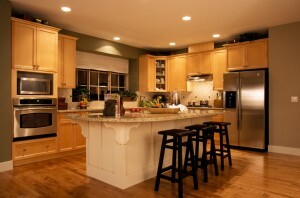 In fact, with the number of efficient appliances out there, it’s hard not to choose one for a kitchen remodel. More efficient appliances add value by reducing energy usage and energy bills. This entry was posted on Friday, March 13th, 2015	at 4:29 pm	. You can follow any responses to this entry through the RSS 2.0	feed. Both comments and pings are currently closed.